This 27 plasmid Cas9-based toolkit is used to quickly institute genetic changes in S. cerevisiae for optimizing heterologous gene expression. This kit contains Cas9-sgRNA (pCut) plasmids for integrating into 23 well-characterized loci, across all 16 yeast chromosomes. The gRNA sequences can be easily exchanged to target additional loci and enable deletion or replacement of genes. A Cas9-based toolkit to program gene expression in Saccharomyces cerevisiae. Reider Apel A, d'Espaux L, Wehrs M, Sachs D, Li RA, Tong GJ, Garber M, Nnadi O, Zhuang W, Hillson NJ, Keasling JD, Mukhopadhyay A. Nucleic Acids Research. 2016 November 28; DOI: 10.1093/nar/gkw1023. PubMed PMID: 27899650. Our toolkit of 27 plasmids contains high-efficiency, Cas9-sgRNA (pCut) plasmids for integrating into 23 well-characterized loci, across all 16 yeast chromosomes. The gRNA sequence can be easily exchanged to target additional loci and enable deletion or replacement of genes. All pCut plasmids were derived from a pRS426 vector and have a 2-micron origin of replication and a URA3 marker. Cas9 is driven by the ADH1 promoter and CYC1 terminator. The sgRNA is driven by a tyrosine promoter with or without (-R) a HDV ribozyme structure, as indicated, and a SNR52 terminator. For plasmid p425_Cas9_gRNA_LEU_1014a, the URA3 marker has been replaced by LEU2 for easy selection on media lacking leucine. Figure 1. 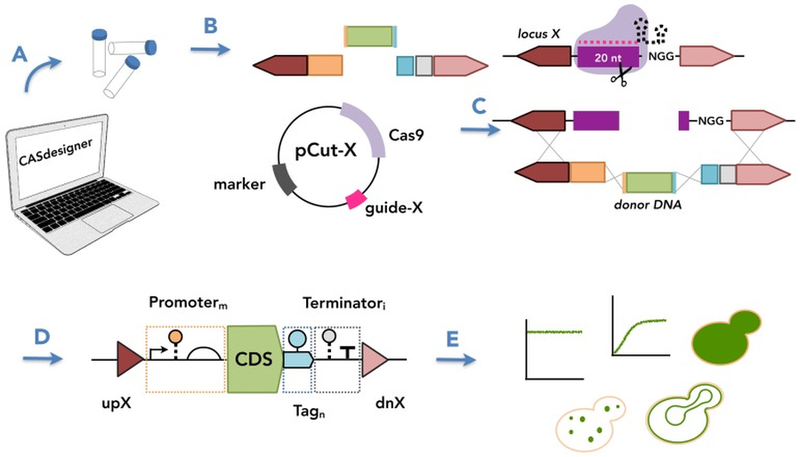 A Cas9-based toolkit to program gene expression in Saccharomyces cerevisiae. This toolkit facilitates strain construction by providing genetic parts that can be used to program gene expression. (A) CASdesigner web-based software assists the researcher in selecting genetic parts and automatically designs the primers required to (B) generate donor DNA fragments with 30–60 bp inter-fragment and 1 kbp chromosomal homology. The homology regions and a Cas9–sgRNA plasmid (pCut-X) together specify the chromosomal integration site. (C) The sgRNA contains a 20-nt guide sequence also present in the targeted chromosomal locus (cut site). The cut site is cleaved by the sgRNA–Cas9 complex, then repaired by donor DNA via HR. (D) The choice of parts can confer different biological activities, here represented using Synthetic Biology Open Language (SBOL) Visual glyphs (triangles, HR regions; half-circle, ribosome binding site; pentagons pointing to the right, protein-coding sequences; T, terminator; arrow, promoter; circle connected by dashed line, RNA stability element; circle connected by solid line, protein stability element) following established conventions. (E) By the choice of genetic parts, a gene of interest can be expressed under various expression programs (level, timing, subcellular localization).